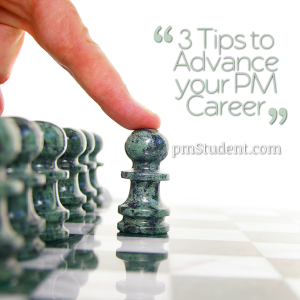 Just recently I was asked to come up with 3 tips to help project managers just like you advance their careers. The goal was to review tips from various sources and then compile them into one article. Of course you want to know how to be a project manager and learn what project managers do. Beyond that it often comes down to who you are as a human being and how you behave. On that note and with a brief imaginary drum roll?.. 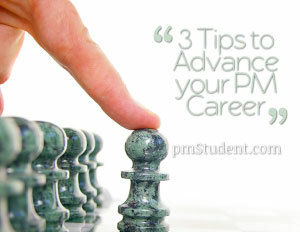 here they are 3 tips to advance your PM career! Be Flexible ? The way to the top is not always straight up. Sometimes you move sideways, and then up. While you remain in the same position waiting for that promotion, others who are more open minded are moving ahead. Before you disregard an opportunity, consider what you have to gain. Does it allow you to learn something new about your organization or industry, add new skills to your portfolio, expand your network or help you build stronger working relationships? You will be compared to others who have shown that they are not afraid to try something new. Be Likeable – Being likeable is a skillset. You have the ability to be liked. Ability is something you can cultivate it is not an all or nothing trait. Project work is accomplished through people. When everything else is equal, people choose to surround themselves with people who they enjoy. When people enjoy working for you, they are willing to go the extra mile for you and you have a better selection of the most qualified resources. How? Think before you speak. Be sincere and be kind. Treat everyone around you with respect. Be a leader whom others admire. Be Low-maintenance – Ask yourself this: ?Do I make life easier for the people I work with, or do I make life more difficult, am I high-maintenance or highly valued?? If you do not know the answer, ask someone you can trust. Napoleon Hill said, “It is literally true that you can succeed best and quickest by helping others to succeed.” No matter how important your title may be or how high your salary is, you are serving others. When you come to the office you are there to serve others. When your actions depict service, others will take notice. Those are some ideas from me, for more be sure to check out the rest of the ideas here.